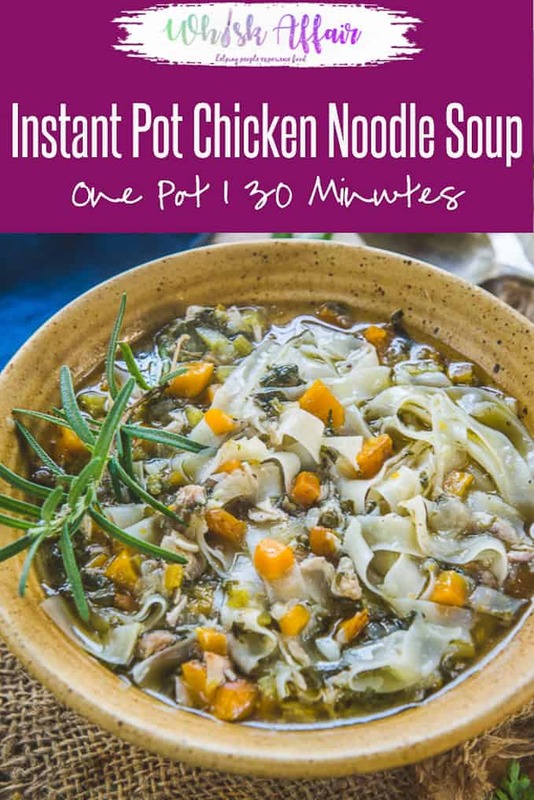 An ideal sip up treat for the cold days, Instant Pot Chicken Noodle Soup is a quick one-pot meal. It is amazingly simple to make even when you feel tad under the weather. And, the cooking time for the same is meagre 20 minutes! 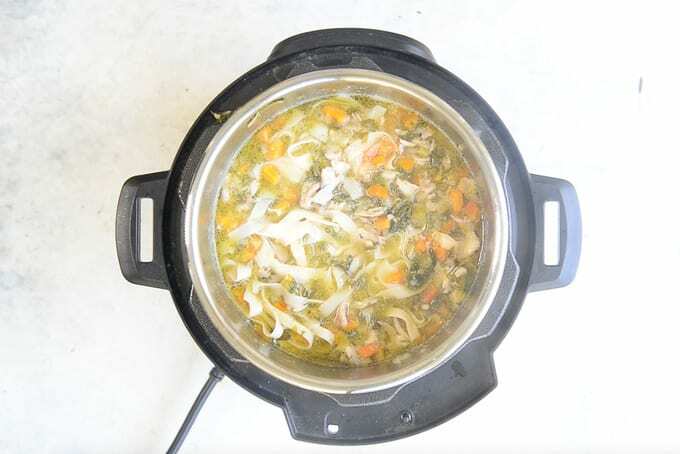 So, learn how to make this energizing soup with my quick guide today! 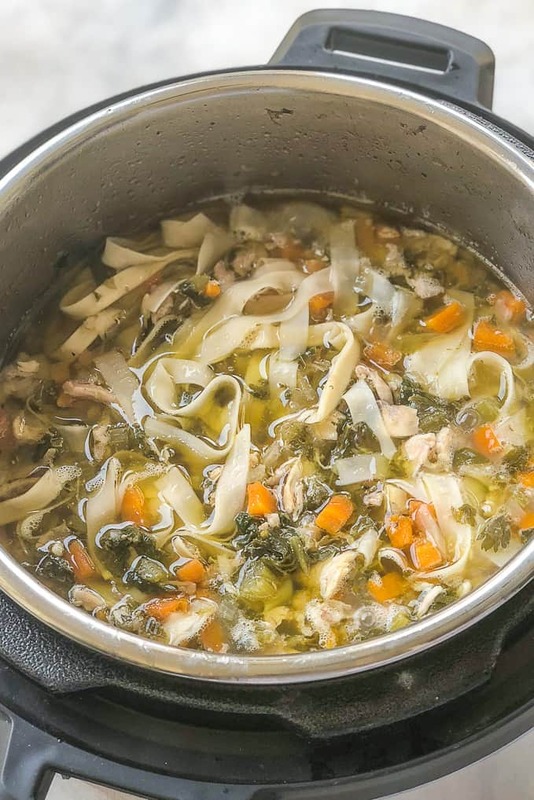 Here is how to make Instant Pot Chicken Noodle Soup. I make chicken breast and chicken thighs often for weekday meals. Especially the dinners. Because you can easily use frozen chicken or fresh one to make Indian Ginger Chicken Curry, Creamy Baked Pesto Chicken Thigh. However, during rains and winter, this Instant Pot Chicken Noodle Soup gives you utmost comfort just like Clear Chicken Soup albeit instantly! Chicken Noodle Soup in Instant Pot is a cake walk to make! Firstly, because, you can finish all the cooking processes in just one vessel because Instant Pot is that functional. Sick or not, this soup is so irresistible, aromatic and quick to prep that you might make it a weekly staple. Although it tastes too good as it is, you may also serve it with Tortilla, Rice/ Brown Rice or sautéed vegetable. Here’s its comprehensive recipe, do read it and try? Which Noodles to use to make Chicken Noodle Soup? Feel free to use any noodles of your choice to make this soup. I used flat thai noodles but frankly, this tastes good with any kind of noodles. For a gluten free version, use gluten free noodles and you can even skip noodles for a low carb version. This soup is very good to freeze. Just follow the recipe until you add noodles to the soup and freeze the soup at this point. When you are ready to serve the soup, thaw it over the counter for 3-4 hours and then heat well. Add noodles and cook until they are done and then serve. How long does Chicken Noodle Soup last? 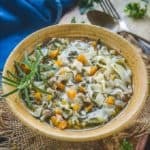 This soup keeps good in refrigerator for 4-5 days. So you can make a big batch and your dinner is sorted for a week. What to serve with Chicken Noodle Soup? This soup is perfect to serve by itself. It is a whole meal with veggies, chicken and noodles giving all the required nutrients for the meal. However, you can serve dinner rolls or a salad on the side to make the meal even more filling. The base of this soup is the broth and make sure its the best you use. I like to make my own broth at home but you can also go for a good canner one too. Cooking the soup with chicken on bone lends a great flavour to the soup, however, if you are pressed with time, feel free to use boneless shredded chicken. You can add vegetables like broccoli, potatoes, bok choy etc along with carrots and spinach to the soup if you wish to. Add the noodles only when you are ready to serve the soup. If you are the not using the whole at one go, then only add the required amount of noodles for that meal. You can also cook the noodles separately and add them in the soup. Cooing them in the broth definitely gives them an edge though. Set the instant pot to SAUTE mode and add butter and olive oil in it’s pot. Add onion and garlic and saute for 3-4 minutes. Add carrots and celery and saute for another minute. Add chicken broth, parsley, thyme, rosemary, chicken, spinach, salt and pepper and close the lid of the instant pot. Press PRESSURE mode and set the timer to 10 minutes. It will take 10-12 minutes for the instant pot to build the steam and start the timer. Once the timer goes off, let the instant pot rest for 10-12 minutes for the steam to release naturally. Now do a quick release and open the lid of the Instant pot. 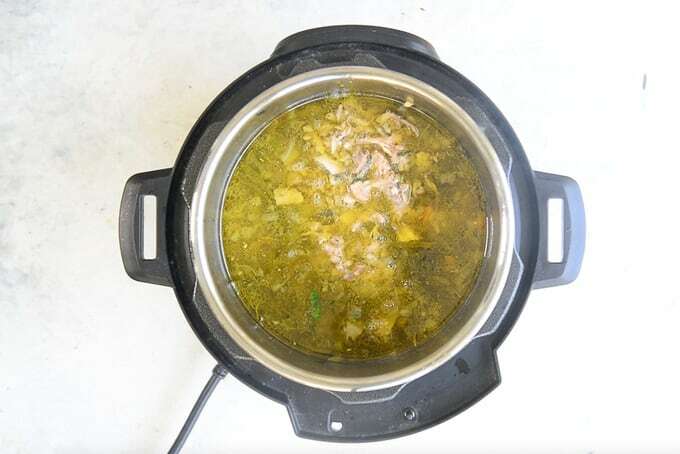 Remove the chicken pieces from the instant pot and shreds them. Discard the bones and add the shredded chicken back in the pot. Select the SAUTE setting and add the noodles and lemon juice in the soup. Cook for 2-3 minutes. 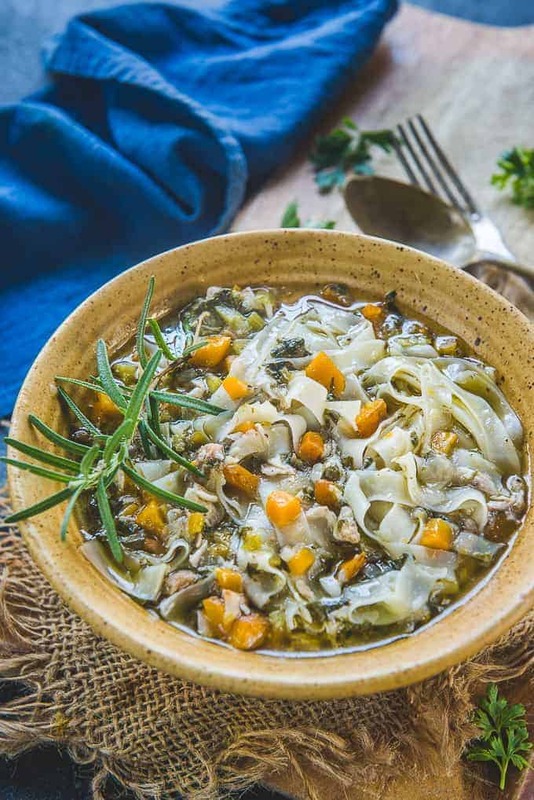 An ideal sip up treat for the cold weather, Instant Pot Chicken Noodle Soup is a quick one-pot meal. So, learn how to make it with my quick guide today! Press PRESSURE mode and set the timer to 10 minutes. It will take 10-12 minutes for the instant pot to build the steam and start the timer. Once the timer goes off, let the instant pot rest for 10-12 minutes for the steam to release naturally. Remove the chicken pieces from the instant pot and shreds them. Select the SAUTE setting and add the noodles and lemon juice in the soup. Do not overcook otherwise the noodles will become mushy. Turn off the instant pot by pressing CANCEL. Fantastic soup. Looks delicious will try soon.